Vintage inspired designer dresses! Flirty trendy little frocks! Beaded gowns, oh my! Getting ready for that gala occasion and need the perfect little thing to slip into? Slip in first to Finders Keepers ll. This designer dress and accessories boutique on main street Spokane specializes in special dresses for those special occasions! 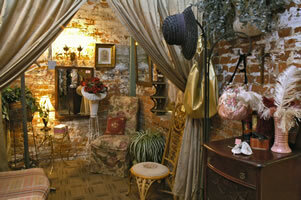 The cozy boutique is warm, inviting and special in itself. One step in the door and you know this place is totally girlie with an eclectic mix of unique and fun things that ladies love! Located in an historic building the warm yellow interior complements the glow of the vintage designed jewelry, beaded gowns and rhinestone sparkle. There’s over 5,000 pairs of one-of-a-kind earrings alone! From head to toe, you will find everything here to complete your look, from the perfect shoes and glorious dress to the distinctive jewelry and designer handbag. Then wrap yourself warm in a selection from the vintage furs, wraps and coats area. So you’re also looking for a unique gift? A fancy flask, catchy business card holder, or a hand blown glass perfume bottle might be the perfect answer. And don’t forget those wonderful soy candles! Ritz, glitz, sparkle and fun, this is one very special little boutique!